Photos From 1903-04 Labor Strike in Cripple Creek & Victor Mining District. 1896 Shooting Affray at Union Theater in Victor, Colorado. Memories of Mrs. Katy Bemore, resident of Independence when the deport was blown up in 1904. Working Underground in the Cripple Creek & Victor Mining District, 1972 to 1979: How I Got the Shaft, the Gas, and the Broken Steel by Randall Stewart. INSTALLMENT #3. Seven Generations In Victor, Colorado and The Mining District—The Way It Was as Recalled by Eleanor Musser Baker. INSTALLMENT #2. Seven Generations In Victor, Colorado and The Mining District—The Way It Was as Recalled by Eleanor Musser Baker. INSTALLMENT #1. Seven Generations In Victor, Colorado and The Mining District—The Way It Was as Recalled by Eleanor Musser Baker. Memories of Edward Franklin Page: Watchman at the Stratton Mines and Subsequently a Mine Manager, Farmer, Retail Businessman, & Banker. Tom Schryver's Memories of Growing Up in Victor, Colorado and His Parents--Mayme & Charles "Bumps" Chapman. McCormick Family Connections to Victor, Colorado (1893-2014) by Mary Ann McCormick Hamm. Paying the Piper by Gertrude Moore McGowan. Gold Camp Celebration--Fourth of July in Victor, Early 1900's by Gertrude Moore McGowan. The Story of Axel Olson & His Golden Girl, Betzi Johnson, by Shirley Beach. Hynes Brothers "Clean Ice" for Victor, Colorado--Memories of Mary Ellen Hynes Chetelat. 1896 Shooting Affray at the "Union Theatre of Varieties" in Victor, CO.
​"Camborne Men in a Shooting Affray, Terrible Result of a Pistol Firing in a Colorado Theatre." Cornish Post and Mining News, February 1896, Cornwall, UK. A dispatch from the thriving little town of Victor, Colorado says that during a performance in the Union Theatre of Varieties Mr. Smith walked down the aisle and approached a table at which four men were seated. He spoke to one of them—Tom Pascoe—by name and accused him of being the leader of a gang of toughs who had threatened to break up the performance. The two men lost their tempers and some hot words passed. At last Mr. Pascoe gave Mr. Smith the lie, and, at the same time drawing his revolver, fired [illegible] shots at him, several of them passing through his chest and head. Smith had fallen to his knees at the first shot, but from that position, fired four shots at Pascoe, one of which penetrated the latter’s heart. Both men dropped dead to the floor, their bodies lying across each other. Friends of the parties were by this time “taking a hand,” and the firing soon became general. Four of the performers on the stage drew pistols and opened fire on a portion of the audience, who sent a hail of bullets around the people on the stage. In the confusion someone turned out the gas, leaving the hall in darkness; but the artists and their foes continued firing in the dark. The din continued unabated, while among the rattle of the shots and shouts of the combatants might be heard the shrill screams of women in the audience. During the early part of the battle, one of the performers, a girl in tights, stood on the stage, a pistol in each hand, which she emptied into the audience as fast as she could pull a trigger. The firing stopped after awhile, the lamps were relighted, and a horrible spectacle presented itself. More than twenty men were lying on the floor wounded; of these three were in the agonies of death. Many of the wounded were taken home by their friends so that it is difficult to accurately ascertain the number of injured. Grave of George E. Smith, died 31 Dec 1895, age 34, Mount Pisgah Cemetery, Cripple Creek, Ron West photo. Graves for Pascoe and Ferguson have not been located. The shooting affray actually occurred during a New Year’s Eve performance at the Union Theatre on December 31, 1895--but news of the tragedy was first reported to the public on January 1, 1896. The men killed were George E. Smith (manager of the theater), Thom Pascoe (by some accounts an innocent bystander, by other accounts the accused leader of the “toughs”), and George Ferguson. A dozen men took part in the shooting and 23 shots were exchanged. The injured included Robert Smith (shot in the thigh), Fred Ellis (arm broken by a shot), Shorty Johnson (bartender, shot in leg), and Wm. Matheny (ex-deputy Marshal, shot in chest). Several others received flesh wounds. By one account all the men were more or less drunk, while other accounts insist the men were not intoxicated. Smith’s object in accusing this crowd of "toughs" was on account of their having guns in plain sight, and he was informed that there were threats made to clean him out that tonight. The men carried their guns exposed because they were going down below Victor to “relocate claims at midnight”. Alternately it was reported these men went into the theater to spend the evening until the hour of their departure to “jump some claims”. Smith and Ferguson were old time enemies, and this was given as cause for the trouble. The funeral of George Smith was held on January 3rd 1896 from the lodge room of the B.P.O.E. in Cripple Creek. Smith was buried at Mount Pisgah Cemetery. On the same day, Thomas Pascoe was buried at Victor under the auspices of Transfer Union No. 1. A notice in the Cripple Creek Morning Times on January 14 from Mrs. George Smith of Victor thanked the members of the B.P.O.E., Federation of Labor and the musicians who generously gave their time and attention at the funeral services of her husband. On the evening of January 14, Smith’s body was exhumed and a second autopsy was performed to address suspicions (by friends of Smith and his widow) that Smith did not meet his death at the hands of Ferguson, but was shot by an outside party (Witherspoon). The autopsy performed at the time of death did not reveal the bullet that ended Smith’s life. The second autopsy recovered the bullet which was determined to be a 45 calibre and could not have come from Witherspoon (as some had claimed) since his revolver was a 38 calibre on a 41 frame. After the autopsy the body was returned to the cemetery and it was reported that Smith’s widow would retain the recovered bullet as a souvenir. Thom Pascoe (and perhaps others involved) most likely had family connections to Cornwall, UK where in 1858 the Miners Association began classes in different mining areas of Cornwall such as Camborne. In 1876 a laboratory was built in Camborne for the use of the pupils of the Miners Association, and in 1888 the Camborne School of Mining was created. Hence the headline in the Cornish Post and Mining News: “Camborne Men in a Shooting Affray”. What was the booming City of Victor like in 1895-96? Most newspaper accounts of the shooting affray reported that Victor had a reputation as a mining camp free of shooting affairs and brawls. Additional Insights About the New Mining Camp Come From the Following Letter Written by Mrs. Hattie Westover Regarding Her Visit to Victor in Early January 1896. The letter was later published in the Greeley Tribune, January 30, 1896, where Mrs. Westover was described as a brilliant, young correspondent. "I have been surprised in several things relating to this place [Victor, CO]. It is much larger than I expected, containing between 6,000 and 7,000 people. There are thirteen blocks of solid business frontage with, of course, a large percentage of saloons and gambling houses ...."
"They tell me the town has been duly surveyed and laid out in town lots. The houses, however, are set hit and miss with a seeming disregard for God or man’s laws. Everything is new, from the houses down to children’s toys, which leads me to calculate how many families have unloaded all their old stuff on the second hand men to the benefit of the Victor furniture dealers." "All of the houses are made level by placing them, either fore or aft, on stilts, and buying a building lot is much like buying a slice off a toboggan slide. But there is this satisfaction--if my neighbor across the street can look down on me from lofty heights, anything in the way of trash which I may be pleased to throw out my back door goes rolling down into the front doorway of the woman who lives still lower down than I do in the alley. Two rooms are considered an abundance for a house--the size of one’s family cuts no figure in the case. Water is brought around in the regulation water wagon …." "The Presbyterian and Roman Catholic churches are in the lead, already having churches. The Methodists are erecting a church building and the others hold services wherever they can rent a hall." "I climbed the mountain and gazed on the outside of the Independence shaft house, where millions of dollars worth of gold lie uncovered awaiting the pleasure of the owner to be taken out. Then we visited the Portland which joins the Independence, and we really did visit the inside of the shaft house and saw them hoisting every three minutes a ton of water." "The husband of my next door neighbor was one of the three killed in a theater shooting affray the night before we got here, and what made it still worse, she witnessed the whole affair. Since coming here I have seen five funerals, but this does not argue anything against the climate as four of them died with their boots on." "I will now tell you what I like in Victor. I like the cheerful expression on the faces, the hurried, business-like walk that every man assumes. I like the song of the hammer, which I never fully appreciated before. I like the rush and roar which is almost constant, of the long freight trains, but best of all I haven’t heard anybody say “hard times”. 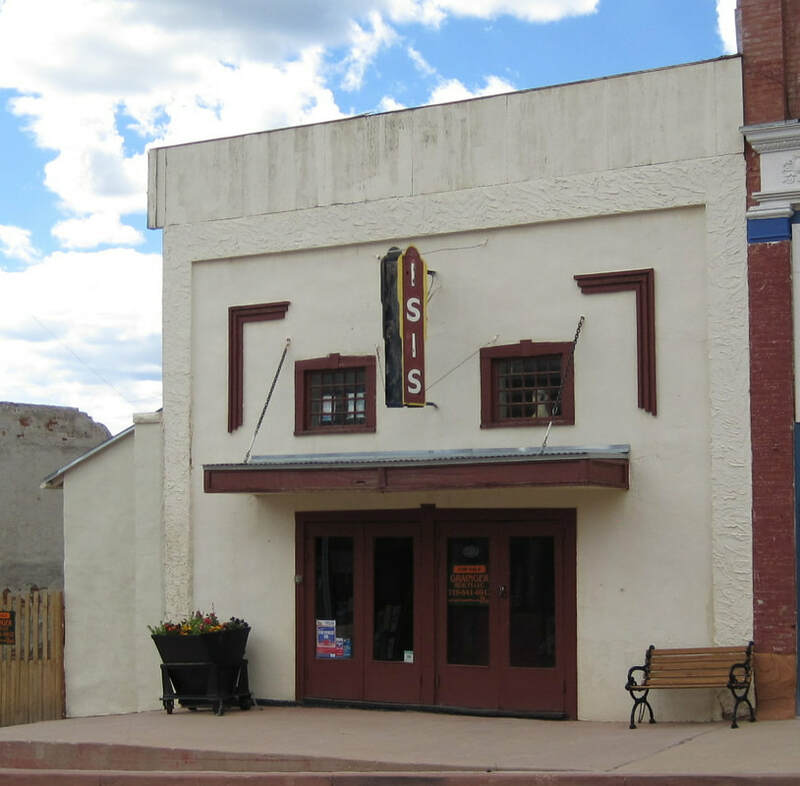 The ISIS Theater at 109 S 3rd St is the only surviving original theater building in the Mining District. It is unlikely this was the site of the infamous "Union Theatre of Varieties" on the west side of S 3rd St in 1896. Thanks to Damian R. Nance and Tony Clarke for sharing the newspaper account of a "shooting affray" at the infamous Union Theatre in Victor, which was published in the Cornish Post and Mining News, February 1896. Nance and Clarke came across the story by accident while researching 19th century mining in Cornwall, United Kingdom. Both are affiliated with the Department of Geological Sciences at Ohio University in Athens, Ohio. *The other newspapers from which additional facts and perspectives were obtained include the Daily Morning Journal and Courier, New Haven Conn; Greensburg Review, Greensburg, Indiana; Cripple Creek Morning Times, Cripple Creek, Colo; Aspen Daily Times, Aspen, Colo; Aspen Weekly Times, Aspen, Colo; and Greeley Tribune, Greeley, Colo.
FYI--In the 1890's, "affray" was a commonly used term to describe an instance of fighting in a public place that disturbs the peace. Today this might be described as a fight, brawl, melee, or altercation. ​ To some it might seem surprising that an account of an "affray" in an infamous Victor theater would appear in a 1896 Cornwall, UK newspaper. But this is a reminder that in the booming Gold Rush Era miners came from all over the world, so friends and family "back home" were very interested in what was happening in the Gold Camp. Articles about events in the Cripple Creek Mining District were also published in newspapers throughout the United States and abroad to provide information about investment opportunities in the District and the expected financial returns. Does the "Union Theatre of Varieties" where the shooting affray occurred on New Years Eve 1895 still stand in Victor? Research suggests that building was most likely destroyed by the Great Fire of August 21, 1899 which wiped out a large portion of the business district. The 1896 Sanborn Maps show a "Theatre Comique" (with "Stage & Scenery" and characterized as a "Dive") located at 407 S 3rd St. After 1900 that location was redesignated as 125 S 3rd St due to renumbering of street addresses when the city was rebuilt after the fire. Glimpses of the "Bawdy Side of Town" are described as follows on the Historic Walking Tour Sign at the NW corner of 3rd & Victor Avenue. As early as 1896, Frank Monroe managed the Union Theatre on the west side of south 3rd Street. The sign also mentions two "Ladies of the Fortune Club," Cleo and Hattie Fay (rooms 3 & 4) who were eventually run out of town, as their burlesque act was "so indecent as to shock the hardened men of the infamous Union Theatre." It is not clear whether the Union Theatre was located on the present site of the ISIS Theater, but soon after 1899 this became a popular location for a theater--except for a brief period from 1902-03 when it was the Union Steam Laundry. In 1904-05 the building once again became an amusement hall called the Crystal Theatre under the management of S.M. Burtis. In 1907, Lowell Marvin and A.A. Shell renamed it the Grand Theatre where vaudeville acts and other sorts of live entertainment performed. In 1912-13, it was called the Ideal Theatre, a hall for silent movies and other dalliances. THE PAST MATTERS. PASS IT ALONG. The Next Generation Will Only Inherit What We Choose to Save and Make Accessible. Contacting Victor Heritage Society, PO Box 424, Victor, CO 80860 or e-mail VictorHeritageSociety@gmail.com. CLICK HERE FOR MORE MEMORIES AND STORIES OF FAMILY CONNECTIONS TO VICTOR & THE WORLD'S GREATEST GOLD CAMP.